Did you know that you can peel pumpkin, butternut squash or any other thin-skinned winter squash with a speed peeler? Well, I didn’t until I saw one of the pumpkin pros on Food Network’s Halloween Wars do it, and man, does it make a difference. You see, I used to use a Chinese-style meat cleaver to break into my squash, and rather than dirty up a perfectly good knife to use as a peeler, I would use said cleaver to peel my squash. Now, over the years I’ve gotten pretty dexterous with that cleaver, but using a speed peel wastes way less of the tender flesh, and may even be a bit easier. Maybe. It freaks onlookers out less, too, which may or may not be a good thing, depending upon your proclivities. If you don’t want to spring for a whole container of creme fraiche, Greek yogurt might make a good substitute here. Or cream cheese. Anything creamy in the dairy family would do, even sour cream. You’re going for a little zing, a little cream, a little thick. Go on, play with your food. You know you want to. Preheat your oven to 425 F. Toss the squash, onions, thyme & oil and spread onto baking sheets in a single layer. Salt & pepper to season, and roast 30 mins. or until tender and just starting to brown around the edges (you may want to stir once or twice to prevent burning and feel useful – if that’s you, knock yourself out. I didn’t and mine was just fine). Once the squash is done to your liking, remove from the oven. This would be a great time to add those squash seeds to the (now vacant) oven. Transfer squash + friends to a large pot. Add the broth, wine & cardamom and simmer 10 minutes. Blend with an immersion blender** (or however you blend soup – in batches in a blender, whatever) until smooth. Add the lemon, stir and taste. Does it need salt or pepper? Add it now. Bring your soup back up to a simmer and kill the heat. Remove from the burner and whisk in the creme fraiche. Serve with crusty bread or a nice peppery arugula salad. Serves 4 for dinner, or 2 for dinner with 2 big lunch portions. 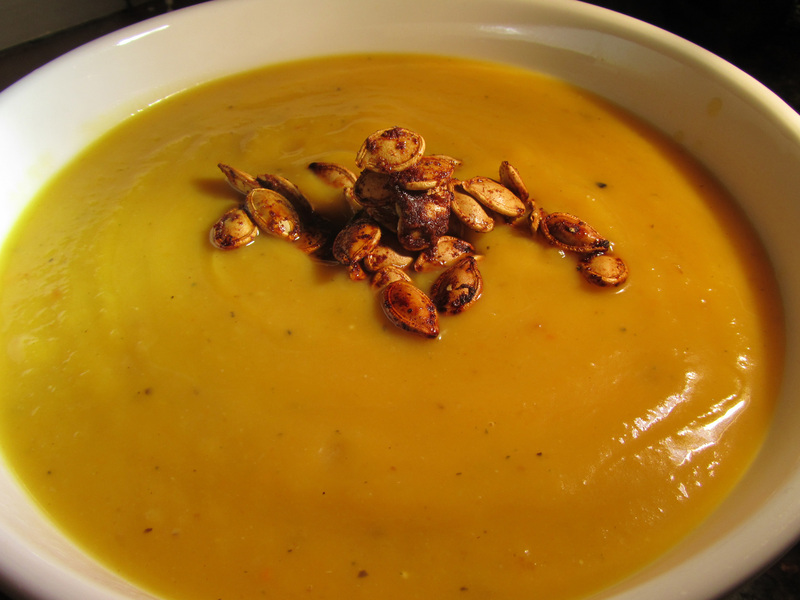 Take the seeds from your peeled squash from the above recipe. Clean and place in a small bowl. Add 1 tsp. each cumin, chipotle powder, cinnamon and brown sugar. Toss with a splash of olive oil and a big pinch of salt. Spread out on a baking sheet and bake ~5 mins. or until browned but not burnt. Be careful here. Ideally, the oven would be at 350 to bake squash seeds, but I like to live on the edge. Just babysit your seeds and they will be fine. A little blackened on the edges is tasty, too, just make sure they’re done enough (read: dry and browned) or the texture will be off. **A note on immersion blenders: If you make soup more than once a year and/or enjoy the occasional smoothie, buy one already. You can get them on sale for under $25 almost any month of the year if you look, and they are worth it. They hardly take up any space, and if you will use it more than once a year, it is a great investment. This is a tool I broke down and finally bought this year. I thought for years that they were a: too expensive, b: too much of a unitasker and c: something I could totally live without – people lived without them for thousands of years, after all. *Horn Sound* Wrong (except for the thousands of years bit). For the kitchen accident prone like me, this method of soup blending has become invaluable. There is zero chance of spilling mass amounts of hot liquid on yourself or for dinner to come crashing to the ground because you lack the arm strength to pour soup from a huge pot safely. Also, splatters with the immersion blender are waaaaayyy smaller than splatters with a bar blender. Just sayin’. Having one of those puppies blow up in your face because you put the soup in while it was too hot and the steam got over zealous isn’t the most fun you can have on a weeknight. Nor is leaking soup out of the bottom of your food processor. Isn’t $25 worth peace of mind? For me it has become so. I love my stick blender. And as an added bonus, it feels “chef-y” too. So there’s that.